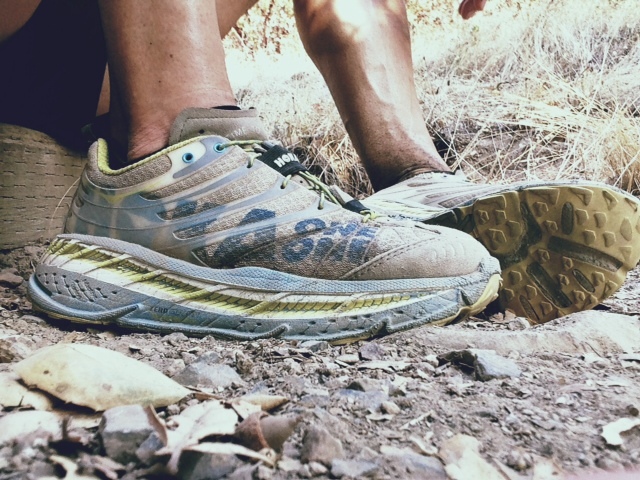 When friend, Victor Ballesteros informed me earlier in the week that he was going to postpone his Tahoe Rim Trail 165mi speed-through, my wheels started turning. 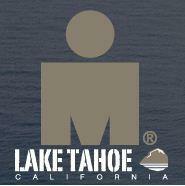 I’d planned on running with him for 30-some miles on Saturday (today), then cheering on my athletes and friends at Ironman Lake Tahoe on Sunday. So with the speed-through attempt out, I went to the interwebs to see if I could find a race on Saturday (c’mon, what the h*ck do you expect?). 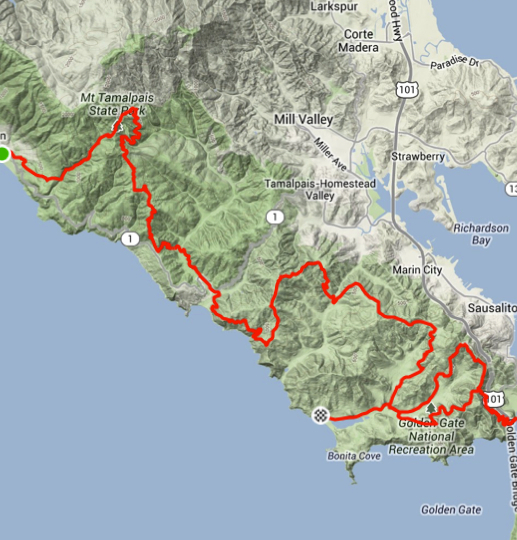 And wouldn’t you know it, Coastal Trail Runs had one locked and loaded for me: Coastal 50k. I’d done this one last year, with lackluster results, coming in about a half-hour behind Bahama Mama Leigh Schmitt. Coastal 50k’s a point-to-point race, from Stinson Beach, meandering back down to where I’d parked my car in the morning at Rodeo Beach. I got there with about 15min to spare before the shuttle to the start departed. When faced with two busses from which to choose, I instinctually selected the one in front, and saw it had room for another scrawny runner. Onboard I soon spied perennial front-runner, Jorge Maravilla. On the winding, twisting, bus-ride up to Stinson, conversation waned and the bus grew quiet as folks dealt with their waves of nausea. I actually broke out into a sweat! So, I swapped positiions with Jorge and cracked the window since I was about to bomb. Just then, we arrived at Stinson Beach. There is a God, and he is benevolent. Shaking off the effects of motion sickness, I ran into fellow Inside Trail Racing Team member, Chris Wehan about 15min before the start. He introduced me to his buddy, Steve Arntson, and I intuitively knew ol’ Steve (actually young Steve) was going to be a threat, since he looked damn lean, like he could float right up the climbs. Leigh won Coastal 50k in 2011 and 2012. His course-record time was 4:04. I had set my Garmin’s Virtual Pacer to a 4:04 50k. And then I found out that Jorge was racing. Knowing a 3:53 50k might be a bit beyond my grasp, all things rationally considered, I dialed in a 3:59:57 (7:44/mi) into my trusty Virtual Pacer. 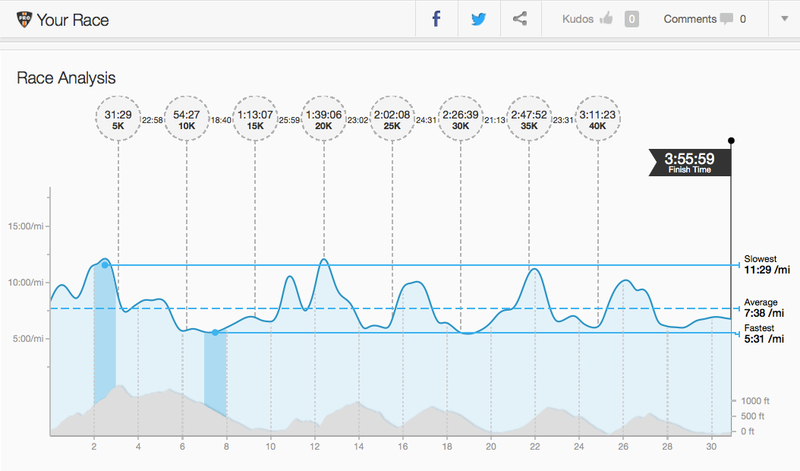 I figured I was in sub-4hr shape since I did a crash-course taper this week after having done some good training over the last four weeks, including one week at 125mi w/ about 20,000′ of gain. Off we went, Jorge was out of sight for most of the race, but I’d occasionally spy a glimpse of him on some of the meandering switchback over the duration. My race was consumed with dicing it up with Chris Wehan’s speedy buddy, Steve (just as I brilliantly deduced pre-race). Steve would catch me on the climbs and I’d do my best to open up a gap on the downs—downhill running being my natural strength in ultrarunning (though I wish it were climbing!). It rained on us most of the race and it was foggier than San Francisco on a rainy day. I embraced the conditions and ran, again for the distance, sans water bottle or vest or any other cumbersome accoutrements. I love it. Just took a few cups of water at aid stations. 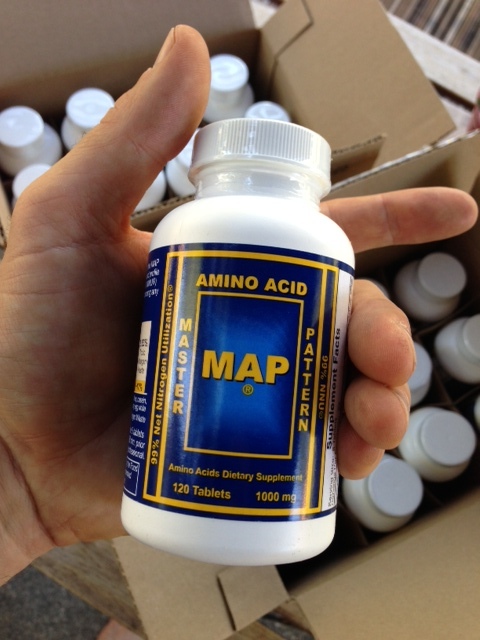 I consumed about 1200 calories, mostly from Clif Shot, over the distance. Sliding around a 90deg turn. Photo credit – Tan L.
Steve Arntson. 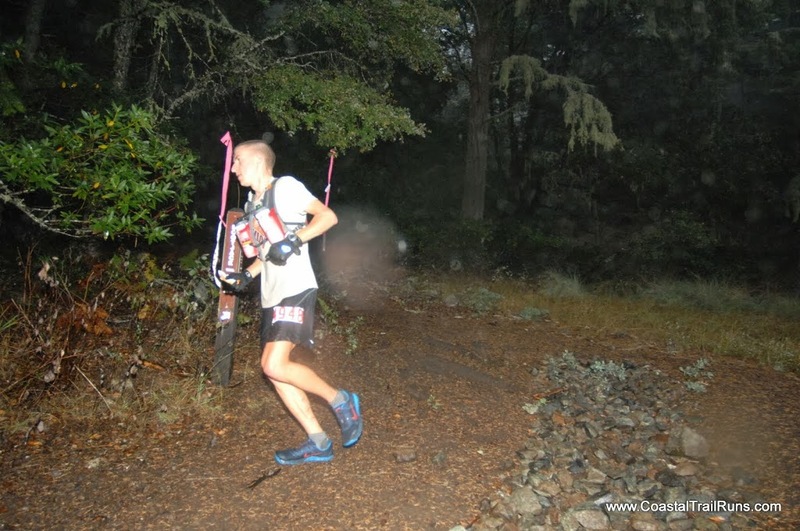 Photo credit – Tan L.
I’d been behind my sub-4hr Virtual Pacer right up to the top of the climb and found myself only down by 2min, thus offering more incentive to work hard on the relative downhill/flat to the finish. It felt good to finally see that thing turn over from “Behind” to “Ahead,” knowing I’d hit my sub-4hr time-target on this demanding course. Apparently there’s something to this whole training thing too. You do more of it, and, it seems… you get faster. Of course the trick is staying healthy and it’s probably a good idea to work on one’s durability so one can stay healthy. 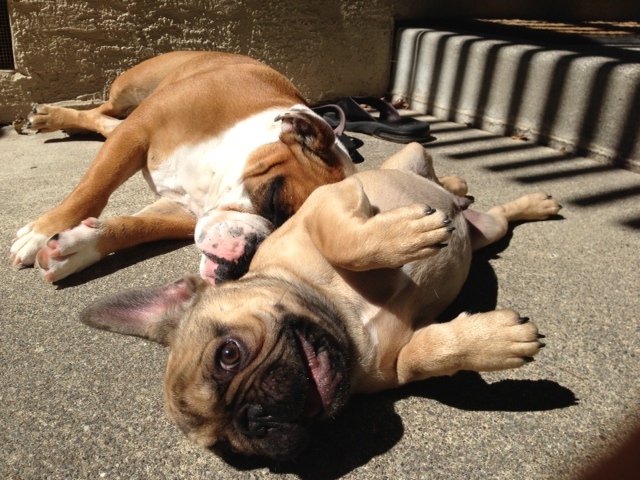 Moreover, working to balance the equation: Training = Work + Rest. T=W+R has likely been my best tool in my injury-free status these last 14 years (let’s knock on some wood for superstition’s sake). 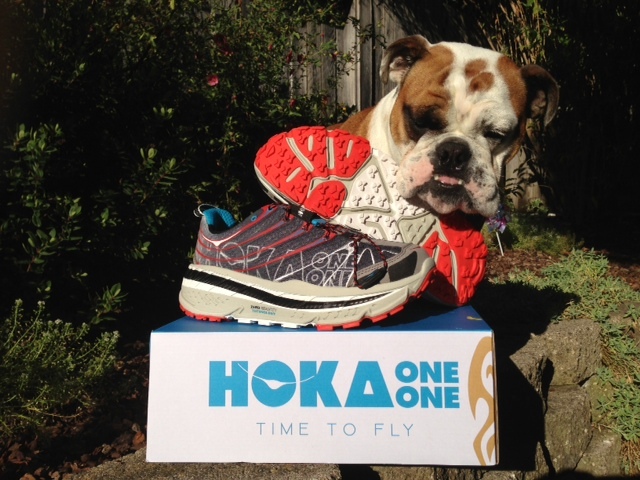 I’d like to take this opportunity to express my gratitude to Kenny Brown at Heart-n-Sole Sports in Santa Rosa, for helping put me in contact with Hoka One One. Without him, I don’t think I’d have been able to pull it off alone. 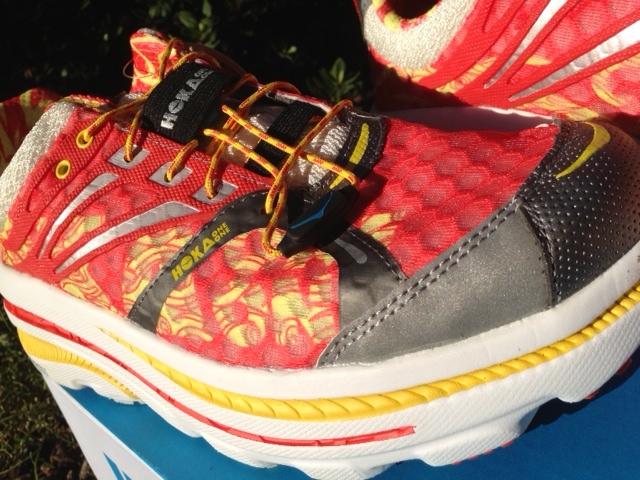 Heart-n-Sole is Sonoma County’s Hoka hook-up. Get in and see them today!! Ruby’s English and Sam’s French. 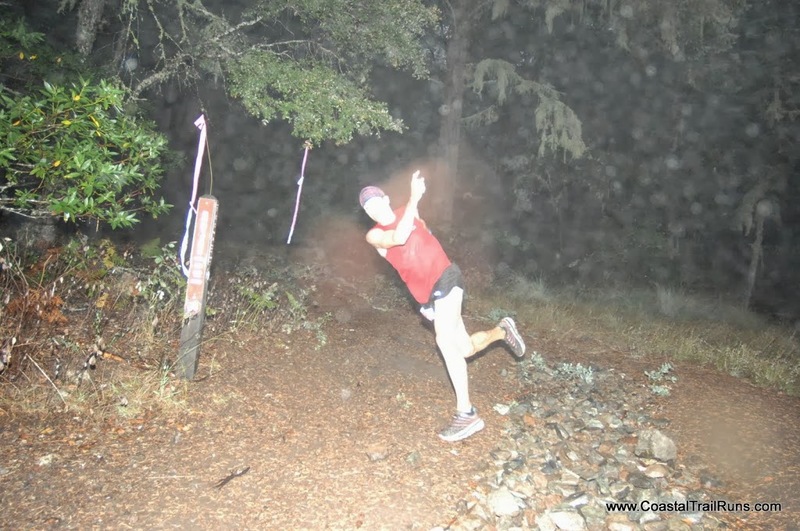 This entry was posted in Race Reports and tagged Coastal 50k, Hoka One One, Jorge Maravilla, PCTR by bobshebest. Bookmark the permalink. Inspiring. 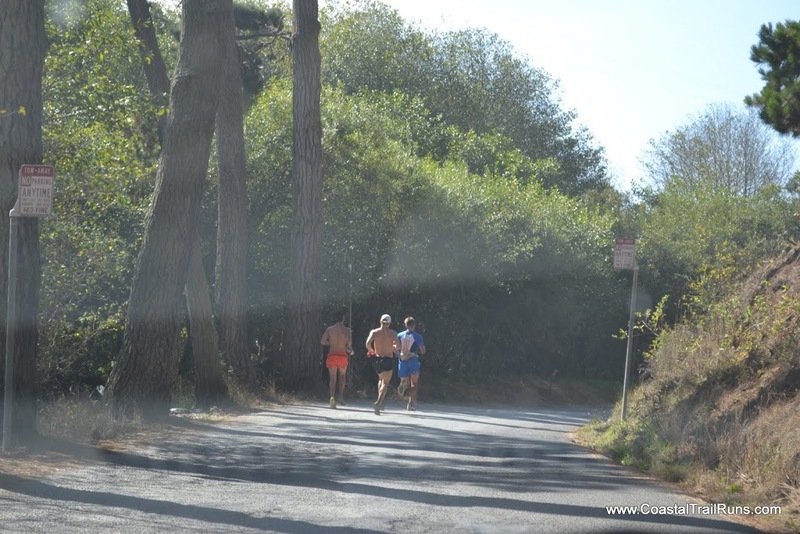 Love this post – wish I had been there at the finish! Fun read. When I saw your time on Strava, I thought it was a mistake. Absolutely phenomenal!